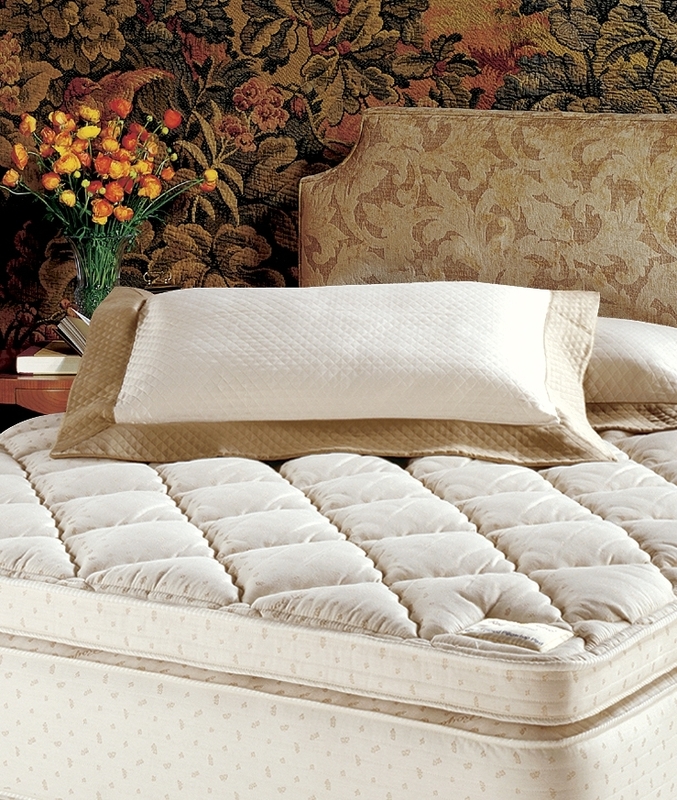 Royal-Pedic's pillowtop pads contain a layer of 100% natural talalay latex surrounded by materials such as untreated French wool and hypoallergenic Comfort Fil 7. They are designed to fit your Royal-Pedic mattress without slippage and are encased within a breathable Belgian cotton ticking - or optionally, certified organic cotton. The latex, or its components, is sourced from sustainable rubber tree plantations in Indonesia and Malaysia. It is shipped to the United States where it is carefully manufactured. The Talalay process utilized involves an aluminum mold which contains thousands of pins which serve to transfer heat evenly, ensuring a strong, vulcanized latex which does not compromise the material's rejuvenating natural "spring." Compared to memory foam, this latex is stronger, more resilient, more reactive, and it does a better job of ventilating body heat. It is also hypoallergenic and chemical free. Meanwhile, the wool is sourced from sheep in the South of France, who live outside all year and whose wool has naturally evolved to be long and curly. There are no chemicals consumed within the diet of these sheep, and there are also no chemicals involved in the process of manufacturing the wool. The wool is pre-compressed into thick layers, providing added reliency and durability while also serving as a natural flame retardant. The 3" Royal-Pedic Pillowtop Pad contains a relatively thin layer of latex, making it a good option for those who want a more luxurious feel while still feeling close to the firmness of their mattress. The 4" and 5" Royal-Cloud Pillowtop Pads feature about twice and three times as much latex respectively, and are recommended for those hoping to turn a firm mattress into a relatively plush-feeling mattress. The Premiere Organic pillowtop pads feature German woven organic cotton ticking, are quilted on both sides (except for the 2" pad), and are wholly organic, featuring extra French Wool Wrap and latex in place of Comfort Fil 7 and a bypoallergenic (but synthetic) insulator pad. The 2" organic pad features a 1.5" layer of latex. For those looking for organic on a budget, Natural Organic Pillowtop Pads are also available. They feature an organic canvas ticking in place of a premium cotton ticking and are only quilted on one side.